Three boys pretend to be the Three Musketeers, but they’re missing the leader of the group. So when Bobby’s grandfather discovers a portal into the book, they can’t wait to join him in Paris in 1626. What they don’t realize is that by appearing and taking part in the adventure, they could possibly mess up the whole book. D’Artagnan must make a secret journey while attempting to hide from Cardinal Richelieu’s men, and he has a few extra passengers along for the ride. Misadventures await them on their trip, and the story begins to unravel. But with Grandpa Max making sure they don’t stray too far from the text, they complete their mission without too much mishap. Fans of The Three Musketeers will probably enjoy this book more than the casual reader, who might not always follow along with the action. The three boys are pretty much indistinguishable from each other, and it’s hard to keep track of who’s who. No character really jumps out as the hero, other than maybe Grandpa Max, and kids may find it hard to relate to anyone. The plot is relatively simple, following the original story with a few side trips along the way. Since I don’t know the original classic, I can’t say for certain where those deviations were, but it would have been nice to see more creative detours that brought out the characters’ personalities. The text of The Wee Musketeers is free of grammatical errors and typos usually found in self-published works, and the author appears to know this classic well. But this book might be better suited as a companion work for studying the original, rather than as a stand-alone story. 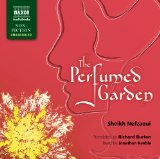 The Perfumed Garden was written in the 15th century by Arab Sheikh Nefzaoui. Like India’s Kama Sutra, it portrays the joys of marital love through words and descriptions. If the reader follows the instructions provided, the author declares he will have an opportunity to experience these pleasures to the fullest. Sheikh Nefzaoui was determined to provide an encyclopedic work in naming sexual positions, and both the male and female body parts. These lists are followed up by detailed descriptions which require some work to visualize properly. Drawings would have been nice, but were not provided with the CDs, and may not have been included in the original text. In addition to the copious lists, short anecdotes and other explanations are included. Commentary on the deceits and treacheries of women is especially amusing, and home remedies for various ailments are also provided, although they should be used with extreme care. Married love is considered one of the greatest pleasures on earth, and both men and women are encouraged to enjoy each other to the fullest. This sensitive subject is handled professionally and skilfully by reader Jonathan Keeble. Taking on the personality of Sheikh Nefzaoui, he encourages listeners to follow his instructions and maximize their pleasure. This quality production would be perfect for couples to enjoy on a quiet evening, letting nature take its course with its message. Prince Dmitri Nekhludov once loved a young girl named Katusha. Many years later, he serves jury duty on a murder case. The accused is Katusha, now a prostitute, and when she is unjustly convicted, Nekhludov’s conscience can’t let the verdict rest. Facing his own role in destroying Katusha’s life, he determines to do everything he can to free her from her sentence. And in the process, he becomes interested and involved in how the prison systems operate. Now he not only needs to protect Katusha, but he also begins to help others who have been unjustly and unfairly imprisoned. Tolstoy’s classic, Resurrection, is a powerfully moving tale of a wealthy and privileged man facing his own inhumanity in the treatment of those who are helpless to protect themselves. In working to save Katusha, Nekhludov is also saving himself from a life of useless and vain pursuits. Neville Jason is marvelous in conveying the drama as it unfolds, and bringing this somewhat dry tale to life. The listener has compassion for Nekhludov and Katusha, as he listens in on their life stories. 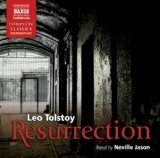 Naxos Audio has created a wonderful production of Resurrection for all who enjoy listening to the classics. Minikin Snickasnee (Minx) is the nine year-old daughter of the town witch. Her mother is evil, and won’t let her go to school or play with the other children. In fact, she dislikes children so much she turns them into flowerpots. Minx hates being a little witch, and desperately wants to be a normal girl. Not one to sit around hopelessly, waiting for things to change, Minx decides to go to school, in spite of her mother’s wrath. She casts spells, hoping for the right one to bring what she longs for. And she makes friends, even though she’s putting them in danger of becoming flowerpots. One day, everything does change, as her efforts are finally successful, and she is able to live the life of her dreams. Little Witch was first introduced in 1953, and this 60th anniversary edition brings this classic back into print. It was named #7 in a School Library Journal poll of top 100 children’s novels, and tops the “most in demand” list of out of print books. In this reprint, nothing is lost of the original, with all illustrations and font intact. If you read Little Witch in your youth, and want to share this timeless treasure with your own kids, this is a must-have edition for your collection. 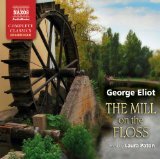 In 1860, Mary Ann Evans, known under the pen-name of George Eliot, published The Mill on the Floss. This intricate picture of the life of Maggie Tulliver, born and raised at Dorlcote Mill on the river Floss, begins when Maggie is a young girl. Spanning two decades, the story revolves around the Dodson and Tulliver families. Maggie’s dearest love is her brother, Tom, who alternately loves and despises her. When her father’s rash decisions leave the family destitute, Maggie is a teenager, searching for meaning in her life. Although she later falls in love, the unsuitability of the match causes her much pain and suffering. This delightfully complex novel introduces some memorable characters. Each has his own strengths and weaknesses, and no one is entirely good or bad. They are all simply human, struggling in a world that often feels very unfair. Naxos Audio has presented a wonderful audio adaption of this unabridged classic. Laura Paton does a masterful job of acting the various roles, and providing different voices for each character. The listener almost feels a part of the conversations as they take place. Although reading a classic can often feel dull and difficult, the audio version brings it to life in a brand new way. I thoroughly enjoyed listening to The Mill on the Floss and look forward to hearing more of these unabridged recordings of the classics. A unique feature of this collection is a background skit placed between the stories, pulling from Halloween lore and tradition. This newest Graphic Classics book is a treasure-trove of great literature, illustrated in ways that make these gems come alive. I love this series! African-American Classics presents comic adaptations of great stories and poems by America’s earliest black authors, illustrated by contemporary black artists. These adaptations are designed to utilize as much of the author’s original language as possible, while also being visually appealing for an enjoyable read. Once again, Graphic Classics has created a wonderful collection of stories and illustrations to introduce the modern reader to great African-American literature. I highly recommend it.